Meanwhile, back in New Iberia, three local teenage girls are killed in a drunk driving accident. Robicheaux traces the source of the liquor to one of New Iberia's 'daiquiri windows,' places that sell mixed drinks through drive-by windows. When the owner of the drive-through operation is brutally murdered, Robicheaux immediately suspects the grief-crazed father of the dead teen driver. But his assumption is challenged when the murder weapon turns up belonging to someone else. Tying together these disparate threads is a maniacal killer named Max Coll, a deeply haunted hit man sent to New Orleans to finish the job of father Dolan. The narration for Dave Robicheaux, Clete, and the host of other characters in these James Lee Burkes book is just so spot on. Will Patton does an amazing job of bringing these characters, and with them, the stories, to life. The Dave Robicheaux character is one of my favorites. 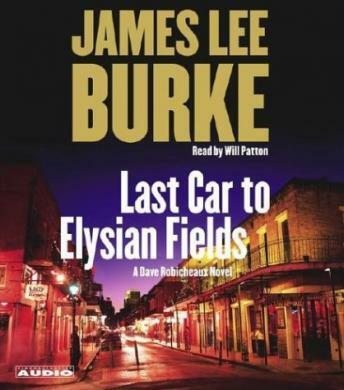 This is not my favorite book of Burke's, but the narration is always great and keeps me coming back for more. Burke's characters are broken, sad, real, gritty and at times terribly funny. Being a southerner, some of the sayings and lines his Clete and Dave use literally make me laugh and cry out loud. I thought by this time I would get tired of reading these novels but I find myself drawn back in every time! Burke's writing is colorful, vivid and consistently strong. I found it slow reading for the most part. I did enjoy the vivid descriptions of the city of New Orleans and surrounding areas, as I had lived there long ago. Not the author's best book, in my opinion. OK, but I felt it dragged on in places and I could turn it off and not want to immediately listen again to find out the ending. I thought the book was GREAT!!! The reader is perfect and ads a lot to the book's charm. I've been listening to about 1-2 books a week for about 10 years, and this was definately one of the best.